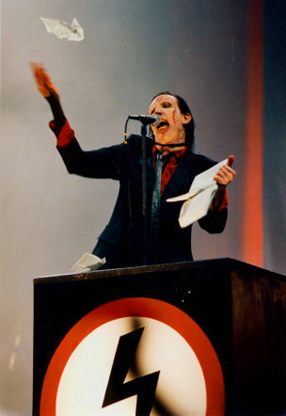 In the 90’s Marilyn Manson was the bogeyman and public enemy number one. He had the Christian right after him, the PMRC after him and politicians after him. Manson set the rock world on fire and was reveling in the wreckage. The teenage element saw him as their evil outlet, thrilled that their parents didn’t approve whom I’m sure would have preferred posters on their kids walls of Hootie and the Blowfish. Manson was the morphed version of Alice Cooper and KISS, a thinking man’s showman, shock sells and he was doing it best. These were different times, grunge was dead and a void needed to be filled, along with ‘The Downward Spiral’ by Nine Inch Nails this album created a wave on the industrial fringe, edgy enough to be controversial but accessible enough for mass appeal. 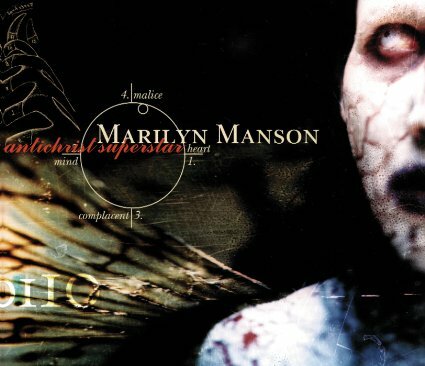 ‘Antichrist Superstar’ had the hooks, especially on ‘The Beautiful People’, a pumping crowd-pleaser inspired by a book written in the 60’s about the Kennedy family and its manufactured perfection, a beauty that was being created, which was shattered by the Charles Manson murders. Understanding the abstract lyrics was secondary; it was all about the riffs and that voice. Manson portrayed himself everything anti that American culture pumped itself up to be. He was a contradiction; I’m neither Marilyn Monroe nor Charles Manson, I’m a bible ripping cross-burning hybrid. The cover of the Eurythmics’ ‘Sweet Dreams’ may have put him on the map but this album tore it up. Would anyone like to read the bible? It was released in October 1996 as a concept piece about a superstar that didn’t fit to a prepackaged perfect world so he chooses evil. I didn’t care about the concept at the time, I was living in California driving around Newport Beach in a Pontiac le Mans, the tape deck in that car must have played this record hundreds of times, it was addictive and a great soundtrack to my head banging capabilities. It went on to sell over 7 million worldwide and debuted at number 3 on the Billboard charts. The number one song on the charts the week this album was released; ‘Macarena’ by los del rio, lord have mercy! As Manson’s fame grew so did his notoriety. After the Columbine School Shootings in 1999, which the media blamed him for as inspiring the killers, he gave a thoughtful interview in the documentary ‘Bowling for Columbine’; it probably gained him more fans but further enraged the protestors outside his concerts, he was receiving death threats, especially at his first Denver gig after Columbine where the record company implored him to wear a vest. As the years past the controversy faded, he never again created an album that had such an impact on his career or the musical landscape but as you listen to such pile drivers like ’Angel with the Scabbed wings”, “Irresponsible Hate Anthem” or “Mister Superstar” its hard to argue this record wasn’t a classic.